1,2 And after this I saw another dream, and I will show the whole dream to thee, my son. And Enoch lifted up (his voice) and spake to his son Methuselah: ‘ To thee, my son, will I speak: hear my words-incline thine ear to the dream-vision of thy father. 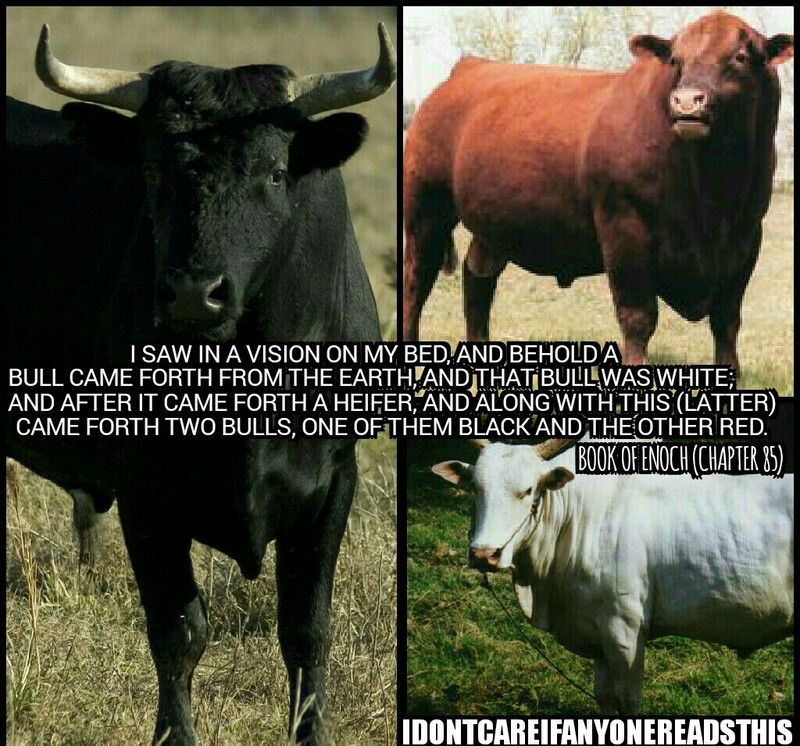 Before I took thy mother Edna, I saw in a vision on my bed, and behold a bull came forth from the earth, and that bull was white; and after it came forth a heifer, and along with this (latter) came forth two bulls, one of them black and 4 the other red. And that black bull gored the red one and pursued him over the earth, and thereupon 5 I could no longer see that red bull. But that black bull grew and that heifer went with him, and 6 I saw that many oxen proceeded from him which resembled and followed him. And that cow, that first one, went from the presence of that first bull in order to seek that red one, but found him 7 not, and lamented with a great lamentation over him and sought him. And I looked till that first 8 bull came to her and quieted her, and from that time onward she cried no more. And after that she bore another white bull, and after him she bore many bulls and black cows. 9And I saw in my sleep that white bull likewise grow and become a great white bull, and from Him proceeded many white bulls, and they resembled him. And they began to beget many white bulls, which resembled them, one following the other, (even) many. 1 And one of those four went to that white bull and instructed him in a secret, without his being terrified: he was born a bull and became a man, and built for himself a great vessel and dwelt thereon; 2 and three bulls dwelt with him in that vessel and they were covered in. And again I raised mine eyes towards heaven and saw a lofty roof, with seven water torrents thereon, and those torrents 3 flowed with much water into an enclosure. And I saw again, and behold fountains were opened on the surface of that great enclosure, and that water began to swell and rise upon the surface, 4 and I saw that enclosure till all its surface was covered with water. And the water, the darkness, and mist increased upon it; and as I looked at the height of that water, that water had risen above the height of that enclosure, and was streaming over that enclosure, and it stood upon the earth. 5 And all the cattle of that enclosure were gathered together until I saw how they sank and were 6 swallowed up and perished in that water. But that vessel floated on the water, while all the oxen and elephants and camels and asses sank to the bottom with all the animals, so that I could no longer see them, and they were not able to escape, (but) perished and sank into the depths. And again I saw in the vision till those water torrents were removed from that high roof, and the chasms 8 of the earth were leveled up and other abysses were opened. Then the water began to run down into these, till the earth became visible; but that vessel settled on the earth, and the darkness 9retired and light appeared. But that white bull which had become a man came out of that vessel, and the three bulls with him, and one of those three was white like that bull, and one of them was red as blood, and one black: and that white bull departed from them. So according to Enoch these bulls were represented like this. WHITE BULL (Adam, Eve, Noah, Shem), RED BULL (Abel, Japheth) and the BLACK BULL (Cain, Ham). 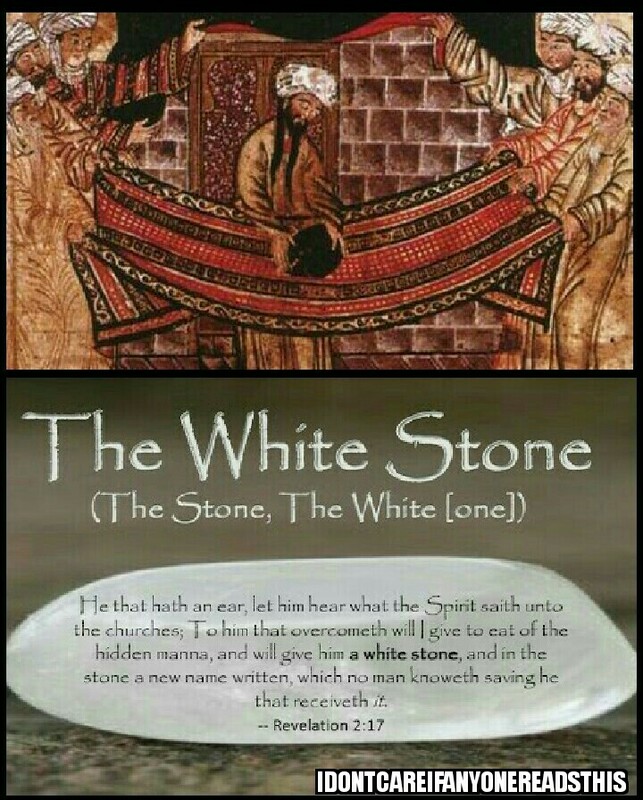 So we can see that the seed that the Messiah comes from is represented by the White Bull. It looks like to me personally, that this Red Bull is representing the Gentile nations that can be grafted into the Messiah that are to become a living sacrifice to God as Abel was. And this Black Bull is where this seed if Satan comes from starting with the Cain and continuing to Hams grandson the Caananites. But it didn’t just stay there, it moves through Kush and onto Nimrod. At this point in history as far as Nimrod goes, we see that that something happens with him and he becomes a mighty man (gibbur). At this point he begins the archetype of this White Bull. Zeus, Shiva and Osiris all take on the form and color of a white bull. This white bull represents fertility and is seen caring the storm god (Ba’al Shamin) on his back. So what we are seeing here is Lucifer wanting his dominion back from Adam that was given to him from God. So then over time, this white bull turns into these men who are representing Lucifer. We see that this Black Bull seed that carried this antichrist spirit was now inverted over to represent this White Bull. And this Red Heifer that is represented as Abel, this represents the Red Heifer sacrifice that was pointing to Jesus. 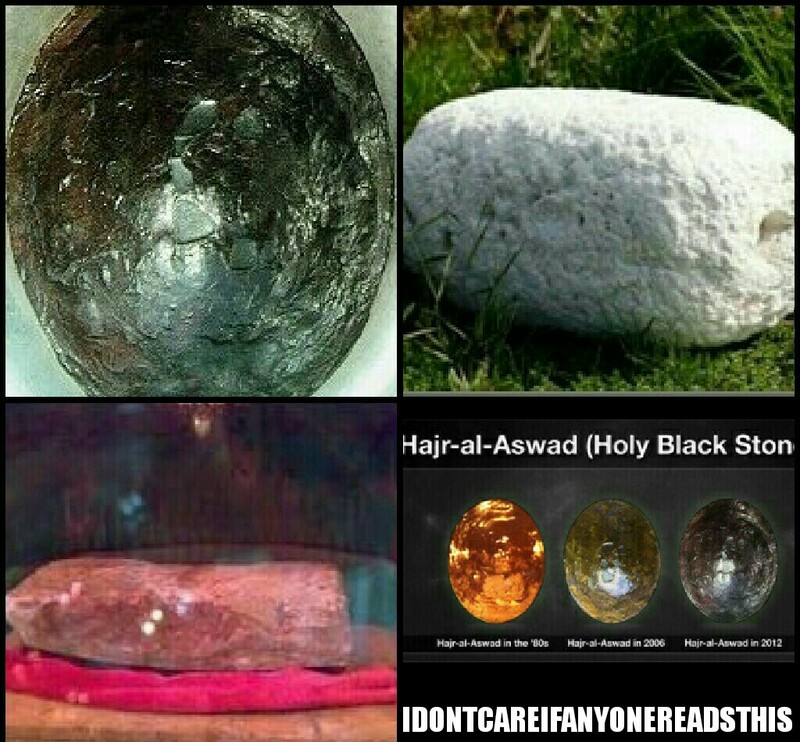 The original black stone which the Kaaba was built around to protect was most likely a meteorite connected with the worship of baetyli or sacred stones, a common practice of the pre-Islamic Arabs. As the ancient Arabs primarily worshipped gods representing astrological entities such as the moon, sun and Venus, the principal deity before Hubal being the worship of the lunar goddess al-Lat, these meteorites were considered to be actual pieces of the gods themselves and the places where they landed were considered the most sacred places of ancient Arabia. These places were considered to be areas to which the spirit and material world met, linking the heavens and earth, metaphorically referred to as the Gates of Heaven (Armstrong-2 221). The worship of these stones was not only connected to the worship of primeval lunar gods to which the Arabs believed were possessed by spirits which afforded them special protection or blessings in war and in economic ventures, according to Grunebaum among others (Brockelmann 8-10, Van Ess 29, Martin 96, Rodinson 16-17). So these stones (red, black and white) were all representing goddesses or gods (fallen angels) and somehow became a link or “axis mundi” for heaven and earth. A direct line or point of contact. So were these three stones/meteors associated with these three bulls? Was this Satans way of taking something that God showed Enoch as symbolism and inverting it and focusing it on himself? Is this the reason why this witch symbolism is the way it is? In the study prior, I connected that this symbolism did come fit this goddess worship but is it deeper than that? Is it going back to the worship of the first murderer (Cain) and first incestial relationship with a son seeing his fathers nakedness which means in Leviticus, lying and having relations with his mother (Ham)? This black stone is a continuation of the black bull worship and we still see today the veneration and acknowledgement of the three goddesses connection in movies and kids cartoons. So were these three colored bulls symbolism the protype for what we have seen over thousands of years? First the bulls in the form of these “god men”. Then these “gods and goddesses”. Then these “stones or meteors”. Then it morphed into these witches that we see in movies and cartoons. This actually may be where it all started. Is this Black stone in Mecca somehow the mixture of worship of both Cain (Black bull) and Abel (red bull) in the idol of Hubal? Stay tuned…it may just be. I do know that according to “witches”, the Moon represents white, black represents Saturn and red represents Mars. One other interesting thing I want to bring up is the three missing jewels in Ezekiel 28. The jewel for Issachar, Gad and Asher are missing in Ezekiel 28 that are on the High Priests breastplate of Judgement. The colors obviously don’t match but I do wonder if these stones somehow or someway related to the three stones that Islam venerates.